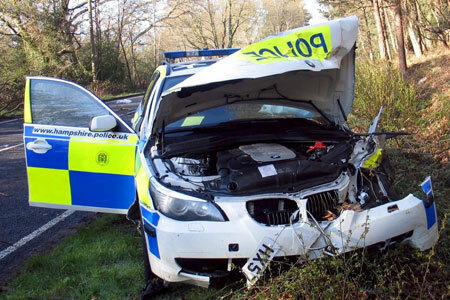 But yesterday, after a car chase in which a stolen Bentley was pursued across Hampshire, no fewer than three police cars were left piled-up in its wake. The chase began in the early hours when officers spotted the £120,000 car, which had been taken during a burglary, on the A35 near Bransgore. A patrol car gave chase and followed the thieves until the Bentley left the road and crashed, turning upside down. In quick succession, the pursuing car collided with the debris and came to a sticky end. But the carnage didn't stop there. A second patrol car hit the wreckage of the first and a third was also forced off the road. None of the five officers involved were hurt in the pile-up – reminiscent of the police car pile-up in the 1980s film – and arrested three men, who received minor injuries.